Clu Clu Land makes me happy when I play it, and I’m not really sure why, because it’s honestly not that great of a game. Basically, some team within Nintendo thought they could come up with a decent arcade game in the tradition of classics like Pac-Man. Instead they ruined almost everything that makes a good arcade game memorable. The controls are needlessly complex, and the the difficulty level unreasonably high and the over all experience frustrating and unrewarding. Just going from Level 1 to Level 2 feels more like you’ve jumped from Level 1 to Level 5, and the game gets tough so fast that only the first few levels are even enjoyable, as after that, the game simply goes so fast that it becomes near impossible to clear the board without instantly crashing into an enemy, falling into a hole, or running out of time. You move around the board by swinging on poles to change direction. I’m sure the developers thought that this was a great innovation, but all it does is make the controls clunky and unresponsive. 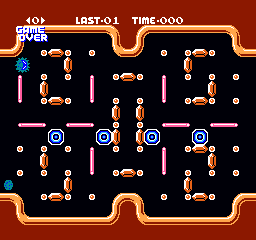 Basically, Clu Clu Land’s levels are a field with a grid of poles staked out within it. Bubbles the Crab can only change direction by holding out either her right or left claw, and swinging around the nearest pole until you let go of the D-Pad, hopefully launching her in the direction you want her to go. 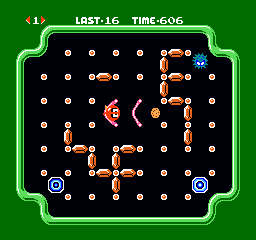 Moving this way has a learning curve, but it’s actually manageable for the first couple of levels, but once you get around Level 4, the game simply demands too many fast paced, precise movements for the player to keep up. 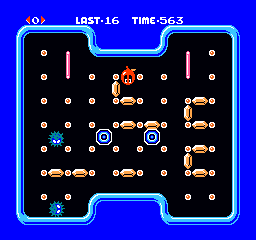 You score points and clear the boards by collecting Rupees that are hidden between the poles. The Rupees are invisible until you actually collect them, and they are arranged so that once you clear the board, they form a simple picture of something like an eagle, a submarine, a butterfly, a mushroom, and so on. 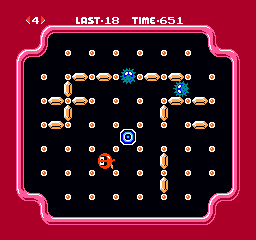 Besides the Rupees, there are also enemy sea urchins that kill you unless you stun them first by firing your crab’s always available sonar beam, and black holes that kill you unless you are holding on to a pole while passing over them. The game also has a really lovely habit of re-spawning you directly in the path of enemies with no hope of survival, which the game will do repeatedly, ruining your game through no fault of your own. Clu Clu Land becomes so difficult so quickly, that most people won’t even survive long enough to realize that there are fun little bonus rounds after every five levels, or that if you have the patience and luck to reach level 20, you’ll find that the action will slow down to Level 1 speeds, and that rolling over Rupees you’ve already collected now causes them to disappear again, adding a whole new challenging and frustrating dimension to the game. For a reward of a High Score that won’t even save to the Game Pak, mastering Clu Clu Land is just not worth the effort. Had the developers played their own game even once, they would have quickly found that it’s easy to, without warning, become trapped bouncing endlessly between two otherwise benign pink bumpers, forcing the player to lose by running out of time. There’s no way they could have overlooked this problem, and I honestly don’t think the creators even cared enough to fix it. 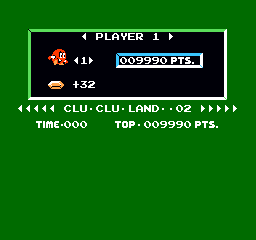 Despite pretty much having nothing but complaints about Clu Clu Land, it isn’t a terrible game. I find myself entertained and amused by this game, and for some reason or another, I keep coming back to it. It’s probably a combination of the music, the cute characters, and the fact that the layout of pegs on the board reminds me of playing Dots with Mom back when I was little. The saddest part is that only a few minor tweeks could have made this game a truely great classic. It’s worth a try if you’re interested in the NES, since Clu Clu Land was a launch game, but don’t pay more than five bucks for it. When this happens, you're screwed.